NES Spy Hunter (USA) in 05:56.86 by link_7777. Spy Hunter is a vertical scrolling driving game with the player in the role of a spy driving an armed sportscar. The object of the game is to travel the freeway destroying as many enemy vehicles as possible while protecting civilian vehicles. The game uses a top-down perspective. The game begins with the player driving the fictitious G-6155 Interceptor. 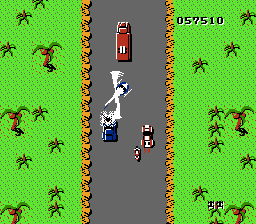 Various enemy vehicles try to destroy the player's car or to force it off the road, including a helicopter that drops bombs from overhead. A counter increments the score while the car is moving and on the road. Additional points are earned destroying enemy vehicles using weapons or by forcing them off the road. Following periodic forks in the road, players can enter new regions with different terrain or weather conditions. Players can also augment the car's standard machine guns with other weapons by entering the weapons van, which appears in each new territory and can be periodically summoned by pressing the blinking "Weapons Van" button. Three special weapons are available: oil slicks, smoke screens, and surface-to-air missiles. Each has limited ammo and are lost if the player's car is destroyed. The game's dashboard shows which weapons are available, when lit. link_7777 rushes through the ten available areas in record time.